Writing an article about the Chanterelle family of mushrooms is a daunting task, and we've long dithered about doing one for exactly that reason. Still, it seems to us that no website dealing with mushrooms in the Pacific Northwest could ever be complete without discussing Chanterelles in detail; some might debate it, but we think it's fair to say that Chanterelles are the most popular quarry for Northwest mushroomers, especially west of the Cascades. Limit it to fall mushrooms, which all Chanterelles are, and they're a shoo-in. So here we go. 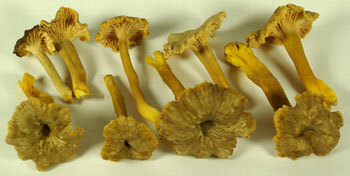 There are several varieties of Chanterelle that all mushroomers in the Pacific Northwest can and often do encounter. They are among the best understood of our mushrooms, and among the easiest to identify. Most are excellent edibles. They all share one key characteristic, at least to a degree: rather than having true gills on the fertile underside of their caps, they have what could best be called ridges. Some folks persist in calling these gills, albeit shallow ones, but with the exception of what the locals call "Yellow Feet," we think calling the underside texture "gills" is a real stretch, so ridges they shall be, for now. These ridges split and fork as they extend up the stem (or stipe) and out all the way to the edge or margin of the cap. They do disperse spores from these things, so apparently - like some humans, perhaps - their being "shallow" hasn't detracted from their ability to reproduce. Mt. Hood is a favorite place for Chanterelles. Mycologists far more knowledgeable than we are tell us that there's a kinship between Chanterelles and coral fungi. The esteemed David Arora's essential book Mushrooms Demystified was the first place we ever read about this link, and Steve Trudell and Joe Ammirati allude to this relationship as well in their recently published Mushrooms of the Pacific Northwest. 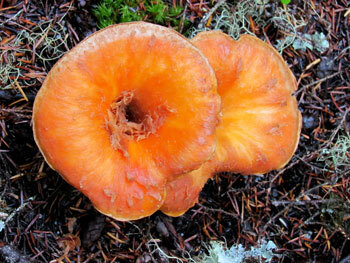 We don't think you would ever guess this by looking at a Chanterelle and a Coral, side by side. Chanterelles are also closely related to Hedgehogs, which are featured in a separate article here, Hedgehogs 101. To our knowledge, all the Chanterelles normally encountered in the Northwest are mycorrhizal, meaning for our purposes that a symbiotic relationship exists between them and the trees among which they grow. The mycelia coat the roots of the trees, helping to protect them from disease and to retain water in the dry months; in return, the mycelia derives nourishment from the trees in ways not well understood. The bottom line is that they are a prime indicator of a healthy forest. Let's deal with the Chanterelle species individually, shall we? For a long time, this was only one group, and we all called them Golden Chanterelles, or for the Latin speakers among us, Cantharellus cibarius. Everyone was quite happy with this arrangement, including us. 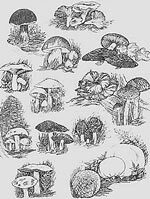 Then along came those old trouble-makers, Steve Trudell and Joe Ammirati, the authors of Mushrooms of the Pacific Northwest, and spoiled everything. Now they tell us that there are several, if not many (!) different species of Golden Chanterelles, including the Pacific Golden Chanterelle (C. formosus), as well as C. cascadensis, and C. cibarius var. roseocanus. The differences are primarily molecular, and the differences in appearance are subtle and far less clear-cut. Call us old-fashioned, but for us, "Goldens" they will remain. The Goldens are strikingly beautiful and generally easy to spot; their bright golden color, ranging from tan when dry to dark egg yellow when really wet, insures that they're highly visible. We'd liken their color, on the average, to apricots. Yet, as bright as they are, it pays to stop every few steps and look back. You'll often wonder, "how did I miss that?" There's usually no great mystery how; you missed it because from your former position, there was something - a log, a rock, something - that the Golden was "hiding" behind. From your new position, that obstruction is no longer in the way. We're often asked, "should you pick them or cut them?" There are different schools of thought. There doesn't appear to be a great impact either way, in terms of future generations. One thing we always do, however, is replace our divots. If we've picked the mushroom, there is a hole or cavity remaining, and we'll generally cut off the dirty end of the stem and put it back in the hole, and cover it with the surrounding duff and debris, patting it down. When we cut them, we cover the cut stem stub in the same way. We think, but cannot prove, that this may benefit future generations and protect the mycelium. At the very least, it helps conceal "your" spots from the prying eyes of others who, if they spot cut stems, just might come back to "your" spot again! Goldens from our coastal property. Goldens grow where they want, but we generally look in forests of Douglas Fir and Hemlock on the wet side of the Cascades. 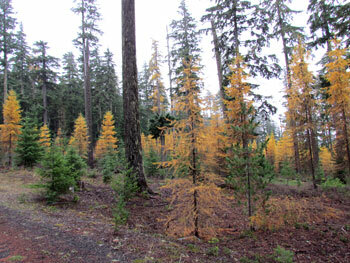 Some of our best finds have been in second growth and even third growth forests. One of the best spots we ever found in the Mt. Hood area was a thicket of "reprod" Douglas Fir of only 25 years of age or so; crews had come through and limbed them several years before we first found it, leaving the debris on the ground. The many downed limbs were thick, and made for very difficult passage; picking there was difficult, to say the least, but the Chanterelles were really thick, year after year. Unfortunately, it was BLM land, and that often myopic agency saw fit a few years ago to arbitrarily install an expensive and very heavy steel gate at the base of the road leading there, miles of a steep gravel road separating us lowly taxpayers from "our" crop." Maddening. 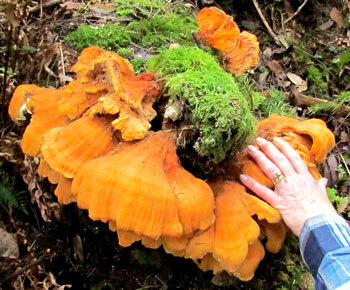 Here on the southern Oregon coast, Chanterelles are more widely distributed - still associated with firs, of course, but there can be lots of tanoak and alder around and it can still be Chanterelle country. Usually, if you find one, you will find more, and productive areas one year will usually be productive in subsequent years. We've sometimes found Golden Chanterelles in the Mt. Hood area as early as mid to late July. They are small, pale and dry, but they're there, and with a little effort, you can find enough for a meal. Later, after the fall rains commence, they are common and run larger, and new rains bring on new fruitings. We go back to productive spots every other week or so, if not weekly. The season will last until the first freeze. The seasons run a little later on the coast where we live, with chanterelles rarely appearing in quantity any time before mid September, and sometimes later. If it's been really wet for several days before you go, the chanterelles will have absorbed a lot of water, and if you don't let them dry overnight on newspaper, be prepared for them to release a lot of moisture into the pan when you cook them. If this happens, just cook them down a little more; the excess moisture will go away in steam, and no one will be the wiser. Preserving Chanterelles is easy. They can be frozen (either sauteed first and packed in zip-lock or vacuum sealed plastic bags, or - what we do - steamed and then packed in their own juices in sealed containers. Canning works great, too (please see our category, "Preserving the Bounty," for a more complete discussion). When we were first getting started, everything we heard and read on the subject advised against dehydrating them, citing problems with them turning tough or, worse, bitter. In recent years, we've seen dehydrated Chanterelles offered in stores, so perhaps someone has figured out how to do this. We haven't tried them, and stick to our routines. Most varieties of Chanterelles (Pigs' Ears being a notable exception) almost never get wormy, a big plus for us. They are, however, appealing to lots of larger critters, notably deer and elk, and it's not uncommon to find them with nibbles. The flesh of Golden Chanterelles is white and aromatic, and is delicious any way you want to fix them. Some books describe the aroma as faintly like apricots. Chanterelles are good-sized mushrooms, averaging between 2 and 5" across; our biggest was a little over 9", but few indeed approach that size. We joked that perhaps it was growing on buried nuclear waste that had caused it to mutate. It didn't seem to glow in the dark, so we guess it wasn't. The research has indicated that you don't have to, but it just makes sense to us to leave some behind. Smaller mushrooms are usually the beneficiaries of this policy when we're around. Pick every one you find if you must, but when you come back next year and don't find many, that little voice in the back of your head will remind you of your previous year's excessive harvest. While Goldens are usually very well-formed and graceful mushrooms, White Chanterelles (Cantharellus subalbidus) are often somewhat misshapen. We don't know why, but our theory is that they grow more quickly. This would also explain their tendency to incorporate fir needles and duff in their bases, which need to be trimmed off. White Chanterelles aren't pure white, but can range from nearly so to beige, except that they frequently have some staining to a color similar to Goldens, often caused by injury. White Chanterelles are solid, dense mushrooms, and we would guess that in a normal year, they outweigh an equivalent volume of Goldens by at least 50%. They don't release as much water in the pan when cooking, either. Their size is similar to Goldens, averaging 4" to 6" across. The flavor is very similar, too, which is to say, "yummy." The Whites tend to be a little dirtier. In the Mt. Hood area and the Cascades, we head for what we call "the transition zone" to find them. That's the area where Douglas Firs and Hemlocks are joined by Tamaracks and Pines. This implies that Whites like areas that are a little drier, although we often find both Goldens and Whites in the same area. We have read that they seem to have a fondness for older forests, but can't confirm this based on our own observations, except that we've never found them among young (20 to 30 year old) trees. Here on the southern Oregon coast, it's less clearly defined. On our property, there are several spots that always seem to have some, year after year, while other spots have only Goldens. If you have a theory on why, let us know; we've asked the mushrooms, but they're very reluctant to share their secrets and are silent on this subject. Pig's Ears (Gomphus clavatus) are, for us, enigmatic. In some years, we find a fair number of them, in other years, almost none. Part of the problem, though, is that they can be devilishly hard to see. The top of their caps is tan to brown, and in most forests they blend in really well with the dead leaves and duff on the forest floor. You often won't see them until you're practically on top of them. Their stems and fertile surfaces are a lovely lavender to purple, but these are often not visible from above, unless you're crawling on hands and knees. The ridges along the underside are much like Goldens and Whites. They often grow together in groups or clumps, overlapping each other. There always seem to be Douglas Firs around them, although not without other species of trees, too. The base of the stem is invariably infused with needles and duff, and so they should be cut rather than plucked. Pigs' Ears are the only members of the Chanterelle family that seem to get wormy, in our experience, so tend to them quickly when you get them home. 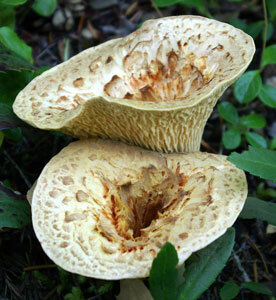 Messrs. Trudell and Ammirati tell us in Mushrooms of the Pacific Northwest that the Gomphus, although considered a Chanterelle, is closely related to stinkhorns, earthstars and the like, which we would never have guessed. They're rarely abundant, but are certainly excellent edibles, with some folks thinking they're the very best of the Chanterelles. These, together with the Blue and Purple Chanterelles, are grouped into the Polyozellus multiplex, according to Trudell and Ammirati in Mushrooms of the Pacific Northwest. They are surely the rarest of the Chanterelles in our experience; we've encountered only the Blacks, tiny little things growing quite densely together in groups. We've never found Blue or Purple Chanterelles, except in books and at the occasional mushroom exhibit by one of the Mycological Societies. Trudell and Ammirati say they occur most frequently in old-growth forests, which may be why we don't find many, since we rarely hunt there. From what we read, they're a bit more common in Northern California. We'd love to find more of them; they're both delicious and beautiful. These (Craterellus tubaeformis) are the last of the Chanterelles to appear, often together with Hedgehogs. We don't often gather them, finding them inferior to the other really good members of the family, including their Hedgehog cousins. Many people do gather them, though, and they admittedly extend the season. They're common in the Cascades and on the coast. Yellowfeet, as they're commonly called here, are small, slender brown mushrooms up to 3" across, with a slender, usually hollow stem, colored yellow at the base. When you find one, you will usually find many; they often grow in large numbers as in a group. The fertile surface underside is much more gill-like than any of the other Chanterelles, but these - OK, gills, if you must - grow down the stem in the manner of their Chanterelle cousins. January usually brings a fruiting of Yellowfeet. We frequently encounter Wooly Chanterelles (Gomphus floccosus and their brown cousins, Gomphus kauffmanii) in the Cascades when we're hunting White Chanterelles, and sometimes in areas known mostly for Goldens. We have never found them on the coast. They're beautiful mushrooms, very striking with deeply dished caps covered in feathery scales. 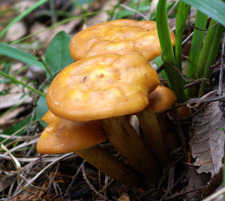 The G. flocossus caps are orange, sometimes vividly so. This is the "Brown Wooly"- Gomphus kauffmanii. For many years, they were classed as inedible, seeming to cause indigestion in some people. We've found literature that cautions collectors that compounds found in the Woolies may affect the liver, although more recent research may challenge this notion. We've heard of individuals who eat Woolies with apparent impunity, but we aren't among them, and we warn others against them. If you're finding Woolies, you're probably also finding good mushrooms that are known to be safe, delicious edibles. Why tempt fate? And this is its showier, orange sister - Gomphus flocossus. There you have it. More years ago than we care to count, it was with Golden Chanterelles that we began our mushrooming career, and we usually recommend the same course to beginners today. They're lovely mushrooms, beautiful and common, and difficult to confuse with any other variety. Best of all, almost everybody loves them on the table! This new video on YouTube is one of the best and most informative 9 minute periods I've spent in years, and I think you'll find it is for you, too. I don't want to give the whole story away, but imagine a world with no more styrofoam - no squeaky, throw-away-after-one-use cups, no large blocks that your new computer, TV or stereo comes packaged in that then fill your garbage can (and the local landfill), and - perhaps best of all - no more styrofoam packaging "peanuts" that scatter everywhere the second you open a package. And all that styrofoam uses tremendous quantities of petroleum (purchased, in many cases, from countries that don't like us very much and use the dollars we buy it with to work against us). Oh, and did I mention that all of this styrofoam we now use will still be around thousands of years from now? You get the idea. Take a few minutes to watch this video. Then, if you agree that this is a great idea whose time has come, forward it to every elected representative you can think of and ask them to enact legislation requiring its use. If our government can foist highly questionable technologies like ethanol and compact fluorescent lights on us in the name of the environment, maybe it could actually do something worthwhile! YouTube - Eben Bayer: Are Mushrooms the New Plastic? And It Continues into January! Yes, our incredible mushrooming season continues into the new year. We celebrated New Year's Eve and New Year's Day by gathering hedgehogs and golden chanterelles and checking on our lovely sulfur shelf that appeared a couple of months ago. What a joyful way to ring out the old and ring in the new! Our spectacular sulfur shelf continues to amaze us.